Moorpark Hyperlocal Short Sale Trends, Has the Moorpark Short Sale Market Been Pulling Back? 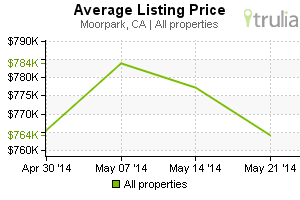 The Moorpark Short Sale Market has been pulling back and prices have recently flattened. Demand measured by the Market Action Index is increasing and days-on-market is holding steady. With more properties coming available, conditions are mildly positive. In the last few weeks the market has achieved a relative stasis point in terms of sales to inventory. However, inventory is sufficiently low to keep us in the Seller's Market zone so watch changes in the MAI. If the market heats up, prices are likely to resume an upward climb. Looking for help? I can help you get your Single Point Of Contact, obtain a Loan Modification or Short Sale your property and get back on your feet. Certified HAFA Specialist Certified Distressed Property Expert Certified Short Sale Negotiator. By Chris B Johnson Realtor. By Chris B Johnson Realtor, Ventura County, Moorpark CA – The Stop Foreclosure Institute recently received a question from Tom about short sales. Here was Tom’s Question. She got the home after the divorce. The court gave her the home in the divorce. The market has declined and the house is worth about 120k less than the mortgage amount. Here was our answer. Tom, you probably should talk to a good lawyer. This is not the standard short sale. There might be tax laws that will allow you to not be liable for the tax liability on the written off debt. In my opinion, the Tax Law allows you to write off most of the forgiven debt on a short sale. Usually you have to short sell the house before the end of 2015 and have lived there for 2 of the last 5 years, but the law is different in California. Your ex probably meets that criterion. I would think that since she lives in the house, then you wouldn’t be liable for the taxes. But, then again, I am not an accountant and don’t know how the law would affect such a unique situation. Will you have a deficiency judgment? We can’t know for sure because there are so many variables involved. However, in about 80% to 90% of the time, you won’t have a deficiency. That is because most lenders just forgive the debt. They have found it tough to collect the upside down debt. Most people are short selling because of financial problems. They are struggling to avoid bankruptcy without a large deficiency judgment. When they see a $100,000 deficiency, then they will probably just declare bankruptcy. Then the lenders gets nothing anyways. Check with a competent short sale realtor in your area. They will be able to give you a good idea of whether or not you will have to pay the deficiency. Thinking about a short sale? I can help you short sale your property and get back on your feet. Send me an e-mail at cjohnson@prucalhomes.com. Chris B Johnson specializes in loan modification assistance and short sales in Ventura County California. Ventura County Loan Modification Help, Ventura County short sales. Ventura County Short Sale Realtor Moorpark CA Short Sales. Moorpark Realtor. Chris B Johnson,Prudential California Realty, Berkshire Hathaway HomeServices , and the Stop Foreclosure Institute are not affiliated in any way, shape, or form with the government. Our services have not been reviewed or endorse by the government or your lender. Most lenders willingly work with agents on short sales. Why? The views expressed here are Chris B Johnson’s personal views and do not reflect the views of Prudential California Realty, Berkshire Hathaway HomeServices . This information on Moorpark Short Sales: My Ex Is Short Selling. What Can I Do? is provided as a courtesy to our viewers to help them make informed decisions. Always check with a good real estate attorney to find out the laws in your state. There are also legal aid non profits that can give you advice on what to do to stop a garnishment or bank account seizure. You should also look at California SB458. With the passage of SB458, the Expanded Anti-Deficiency Law May Have Unintended Consequences on Ventura County Short Sales. For Disclosure, and more information on Mortgage Assistance Relief Services, please see Code 16 of Federal Regulations (FTC), Part 322, or , http://www.ftc.gov/opa/2010/11/mars.shtm and always consult your CPA, Accountant, Financial Advisor and Attorney before you any financial or legal decisions. Certified Distressed Property Expert. To Read More About The Potential Tax Consequences of a Short Sale: Click here..
Loan Mod vs Short Sale Click here..
By Chris B Johnson Realtor, Ventura County Short Sale, Thousand Oaks Short Sale Map, Simi Valley Short Sale Map, Moorpark Short Sale Map. I can still hear my parents voice "Do as I say, Not as I do!" This adage could be no truer today after it has been reported, in a recent Herald Tribune article, that when it came to selling his Florida mansion, Al Bennati, the longtime chief executive of BuyOwner.com, has chosen to list his home with a local real estate agent. "BuyOwner.com allows you to reach the most potential buyers in the shortest amount of time, in the most effective (the Internet) and most cost effective manner (no commission!) possible." "To sell a home of this magnitude, it needs to be done by a person and a company that reaches buyers of this caliber." Ventura County Short Sales: Can I Rent My Ventura County Home If It Is In Foreclosure? Moorpark CA – The Stop Foreclosure Institute of Ventura County recently received a question about renting a home in foreclosure. Short Sale Question: I am selling 2 of homes that are short sales. I would like to rent the homes during the foreclosure process. I will continue to pay the home owners association fees. I will not be paying the mortgage. Is it legal to do this? Is there any liability that comes with it? Here was our answer to them. The Stop Foreclosure Institute is not a law firm. Therefore, we can’t answer as to whether or not it is legal. We recommend that you check with a lawyer before making a decision. We do know that there are laws forbidding that practice in many states. For example, California recently passed a law that stated that you had to notify any potential renter whether or not the home was in foreclosure before renting. From what we have heard about the law, if you lease a property in foreclosure and don’t tell the tenants, then it is a criminal offense. If it was a problem in California, then it was a problem in other states and they probably passed similar laws. We have seen cases in the past where a homeowner sold their home as “Owner Financing. The home was in foreclosure and buyers filed a police report. The sheriff’s office investigated the homeowner for fraud. The people who thought they were buying the home paid the owner a large down payment. They didn’t know the home was in foreclosure. He disappeared with their money and they were kicked out by the bank. We don’t know what ended up happening. The bottom line is that anything fishy can have future repercussions. So check with a lawyer to make sure you won’t have any problems. Thinking about a short sale? Chris B Johnson is a Realtor with Prudential California Realty, Berkshire Hathaway Home Services . Chris B Johnson, Prudential California Realty, Berkshire Hathaway Home Services, and the Stop Foreclosure Institute are not affiliated in any way, shape, or form with the government. Our services have not been reviewed or endorse by the government or your lender. Most lenders willingly work with agents on short sales. Why? The views expressed here are Chris B Johnson’s personal views and do not reflect the views of Prudential California Realty, Berkshire Hathaway Home Services . This information on Moorpark Short Sales: Can I Rent My Home If It Is In Foreclosure? is provided as a courtesy to our viewers to help them make informed decisions. Get a Market Snapshot of your neighborhood To Get A Market SnapShot Click Here . Are Home Values UP or Down?. For Housing Trends Click Here. Short Sale vs Foreclosure Click Here. Chris Johnson is a real estate agent with Prudential California Realty. He specializes in helping sellers avoid foreclosure. Chris joined the Stop Foreclosure Institute to assist homeowners in Ventura County and the surrounding areas. The Stop Foreclosure Institute offers training and education to Real Estate Agents. Chris has been accepted as a member by the Stop Foreclosure Institute. The local members assist homeowners in their area to avoid foreclosure. They are trained in many of the different techniques to avoid foreclosure. Here are a few of the ways that the Stop Foreclosure Institute can help you avoid foreclosure. 1. We offer a low cost Loan Modification Kit to homeowners who want to use it to reduce their mortgage payment and avoid foreclosure. Getting a loan modification is tough and we include the tools you will need in order to get your best shot at having your lender approve your loan modification. 2. We help homeowners in foreclosure stop harassing debt collector phone calls and regain their sanity. You can stop the Debt Collector Calls. You can even get up to $1,000 from any debt collector who calls you after you request they stop. 3. We assist homeowners who would like to sell their home. We can help you sell normally if you have equity. If you are upside down, then we will assist you with a short sale. This is when the lender allows the house to sell and accepts less than what is owed. Chris specializes in short sales in Ventura County and the surrounding areas. We believe that selling a home is only one of many options available to homeowners to avoid foreclosure. Please call me at (805) 208-0823 to get more info on the Loan Modification Kit or to discuss a short sale. How Long Do I Have To Wait After A Ventura County Short Sale To Buy Another Home? Ventura County Short Sales: What Do You Tell The Bank Negotiator When You Have Multiple Offers? Ventura County Short Sale- By waiting It Out, Your Short Sale May No Longer Be Short! HYPERLOCAL-Ventura County, Thousand Oaks Short Sale Real Estate Trends, Up, Down or Sideways? What is my Home Worth? Do I have Equity? Find out here: Click Here. 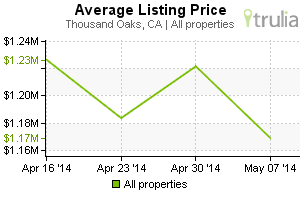 The Thousand Oaks Short Sale market has been cooling over time and prices have recently flattened. Despite the consistent decrease in Market Action Index (MAI), we're in a Seller's Market (where significant demand leaves little inventory available). If the MAI begins to climb, prices will likely follow suit. If the MAI drops consistently or falls into the Buyer's zone, watch for downward pressure on prices. With inventory and days-on-market basically unchanged and the Market Action Index increasing, the market is not sending strong directional signal for the near-term outlook. If you would like periodic updates on what is going on in Your Neighborhoodor the Ventura County Real Estate Market, Click on the Links!